Public Programs — Wing on Wo & Co. 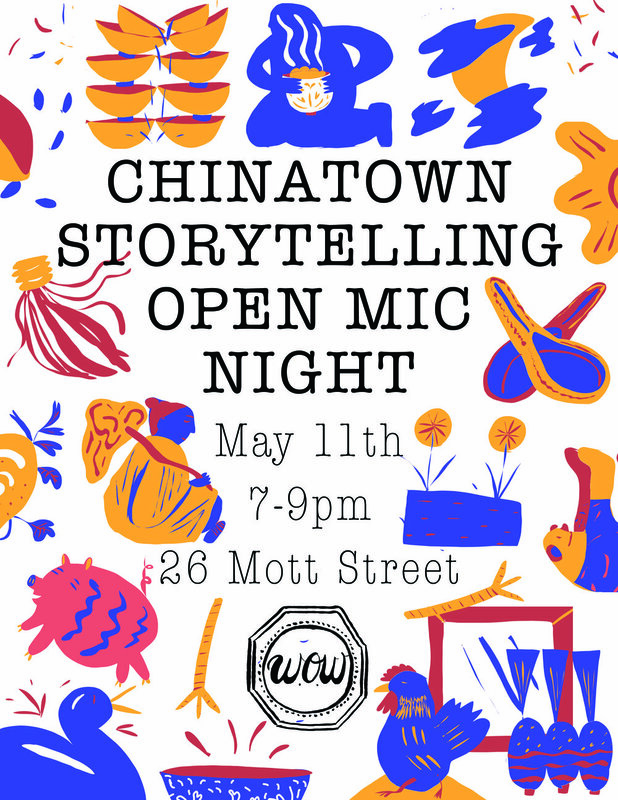 The W.O.W Project’s mission is to sustain ownership over Chinatown's future by growing, protecting and preserving Chinatown's creative culture through arts, culture and activism. Friday, March 1st / 7-8:30PM / 26 Mott St.
Join us *this* Friday for our final 店面 residency event! ‘Through Queer Lenses: Orientalism & Traditionalism’ is a panel discussion asking queer artists with Asian heritage how they make work in light of both orientalism and traditional culture, in order to celebrate QTPOC lives, narratives, and stories. We are so thrilled to have Wo Chan, Rin Kim and Ka-man Tse in conversation with our 3rd artist-in-residence Vincent Chong. Join us for our annual confetti collection led by our youth art and activism program Resist Recycle Regenerate (RRR) from 12:30-2PM on Mott Street just a hop skip and a jump away from W.O.W.! The RRR fellows will be clad in vibrant red jumpsuits forming a street-cleaning task force to collect the colorful paper casings from the fireworks of Chinatown’s Lunar New Year Super Saturday. The collected bounty of street-trash will then be transformed into paper mulch during free community papermaking workshops in collaboration with our community partners in March. We will have gloves, RRR plastic bags, brooms and dust pans for anyone who is keen on joining us anytime between 12:30 and 2pm on the 16th! Follow @wingonwoandco on twitter for live location updates ! Abrons Arts Center, Wing On Wo & Co.’s W.O.W. Project, and YELLOW JACKETS bring in the “Year of the Pig” with a celebration for the Lower East Side and Chinatown communities. Join us for live performances, art activities, karaoke, DJ sets and refreshments from local restaurants. "The Year of Abundance: A Lunar New Year Celebration" is presented as part of the ICPP Curatorial Leadership Fellowship, with support from the Ford Foundation. Abrons Art Center is a home for contemporary interdisciplinary arts in Manhattan’s Lower East Side neighborhood. As a core program of the Henry Street Settlement, Abrons believes that access to the arts is essential to a free and healthy society. Through performance presentations, exhibitions, education programs and residencies, Abrons mobilizes communities with the transformative power of art. The W.O.W Project is a community-based initiative that reinvents, preserves, and encourages Chinatown’s creative culture and history through arts, culture and activism. 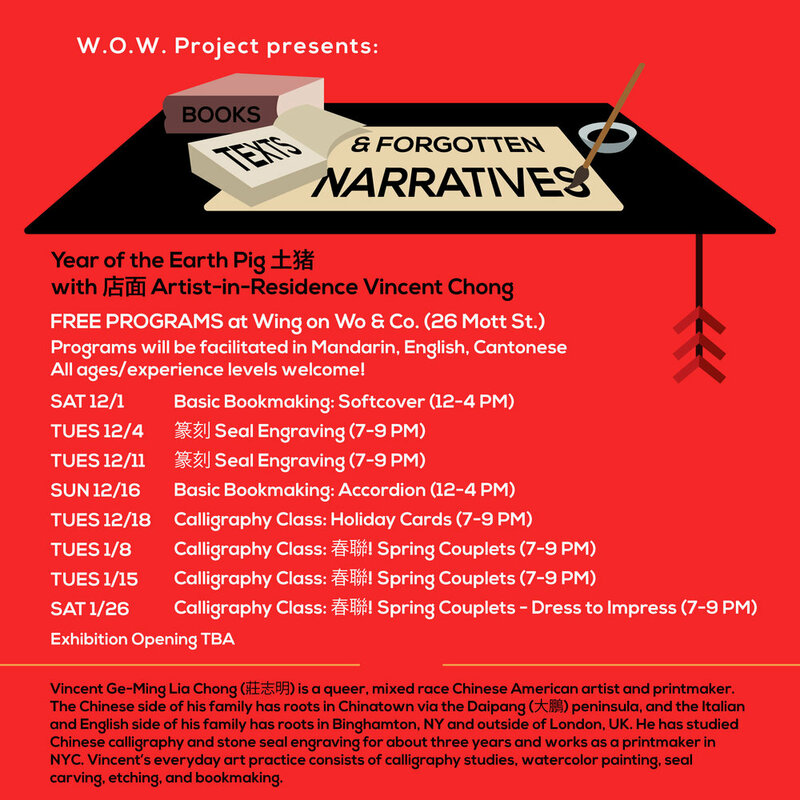 Located inside Wing On Wo & Co., the oldest continually-run family business in New York's Chinatown, The W.O.W Project was established by fifth-generation store owner, Mei Lum, to bring concerns of a rapidly changing Chinatown into a resident-led space for intergenerational dialogue and action. Since its inception in 2016, The W.O.W. Project has held numerous panel discussions about the role of art and social change, an annual storefront artist-in-residency program, film screenings showcasing Asian American women filmmakers, and several Chinatown storytelling open mic nights, that have reached over 1,000 residents. Our core mission is to create space for conversations to happen across language barriers and generational gaps to actively shape the future of Chinatown. YJC is an intersectional collective of queer Yellow American femmes collaborating towards futures that center marginalized bodies. Join us for our 3rd artist-in-residence Vincent Chong's opening reception of his Lunar New Year installation! Vincent's works as well as handmade books, calligraphy and seals by workshop participants will be on view in Wing on Wo's window. Food and drinks will be provided on a first come first serve basis. W.O.W. Project's third 店面 artist in residence, Vincent Chong, is a queer, mixed-race Chinese American artist. Vincent is interested in representation through art on paper and how we can use these materials to express the complexities of our identities - queerness, transnationalism, etc. On one hand these workshops will introduce participants to the traditional tools and strategies used to study Chinese calligraphy. On the other, they will function as spaces of discussion about how we carry traditions as young people -- how we acknowledge and imagine the narratives of those erased through history, and how we establish agency and ownership within these traditions. How can writing help heal? How do we find and create safety within ourselves? Who are the QTPOC writers we write in conversation with? As our communities, bodies, and psyches continue to be under attack, how can we be our greatest resource? Over the course of two sessions, we will hand make books and write. We will read the work of queer and trans writers and artists, and delve into the sonic — the embodied emotions that move us — to write our truths and stories. You will create softcover books and write in community with other QTPOC writers and facilitators. This workshop is a collaboration with Huiying B. Chan, a creative writer and cultural organizer from NYC, and Vincent Chong (莊志明), a queer, mixed-race Chinese American artist who is the current artist-in-residence at Wing on Wo. It is held as part of a series of workshops organized by The W.O.W. Project. Huiying's work is at the intersections of writing, healing, and cultivating community through cultural programming. Vincent is interested in representation through art on paper and how we can use these materials to express the complexities of our identities - queerness, transnationalism, etc. These workshops aim to be spaces to grow our writing and bookmaking skills and inherently hold space by and for QTPOC. We will talk about how we in the diaspora both carry and create tradition, and how we build on narratives that may have been erased in histories. Ultimately the goal is to find our power in our voices and truths and creating, unafraid. 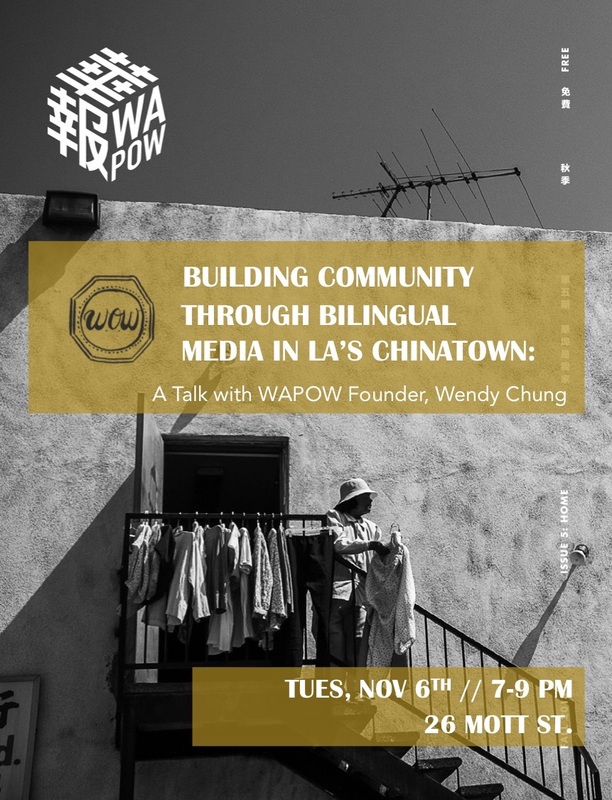 Join us as LA native and Founder of WAPOW magazine, Wendy Chung talks about how she started and envisioned the bilingual print magazine to be a resource to share information and highlight personal stories in a time of rapid neighborhood change and urban development in LA's Chinatown. Wendy will be in conversation with Diane Wong, Assistant Professor and Faculty Fellow at NYU Gallatin School. We're so excited to be hosting Wendy after meeting her during our west coast tour a year ago to date! WAPOW / 華報 is a bilingual print magazine in LA Chinatown centered on storytelling, civic engagement and cultural stewardship. WAPOW is published seasonally with 10k copies printed each run, shared in Chinatown and affiliated Southern California communities. It is structured as a service learning project, engaging a multigenerational team of contributors to research, write, illustrate and distribute each issue. Wendy Chung (鍾佩晶) was born and raised in Monterey Park, a suburb of Los Angeles. She grew up visiting LA Chinatown with her family on weekends, eating pho and exploring the bustling plazas. Wendy is a second generation Chinese American. Her parents came to Los Angeles in 1979 as Vietnam War refugees. Her professional background is in urban planning, mass communication and local economic development. In the past, she has worked in local government, specializing in economic development, civic engagement and housing issues. She is currently transitioning into family business, taking over her parents' 30-plus year-old electrical supply house. Wendy is passionate about community engagement and creative media. In 2017, she created WAPOW, a bilingual print publication in LA Chinatown that engages a multigenerational team of volunteers to produce a magazine highlighting local Chinatown news and culture. Prior to starting WAPOW, Wendy first got involved in Chinatown organizations through her graduate studies at USC. In 2016, as part of her Dual Master's in Urban Planning and Public Administration, Wendy completed an independent research project examining local economic development in Chinatown, where she remains involved as an active member of Chinese Historical Society of Southern California and Chinese American Citizens Alliance. Wendy's Bachelors of Arts is from UCLA in Anthropology and Communication Studies. W.O.W. Project's third 店面 artist in residence, Vincent Chong is a queer mixed race Chinese American artist, offering workshops in Chinese calligraphy throughout the fall. Vincent is interested in representation through art on paper and how we can use these materials to express the complexities of our identities - queerness, transnationality, etc. On one hand these workshops will function as introductory courses, introducing participants to the traditional tools and strategies used to study Chinese calligraphy. And on the other, they will function as spaces of discussion to chat about how we carry traditions as young people -- how we acknowledge and imagine the narratives of those erased through history, and how we establish agency and ownership within these traditions. *Please note that we have a limited capacity of 15. We will also be setting up in Columbus Park on Saturday 10/20 from 12-4pm for anyone who can’t make it to our Tuesday night sessions. Thursday, July 19 // 7-9PM // Project Reach NYC 39 Eldridge St.
Join us for a night of storytelling and honoring the voices of writers, artists, and creators across the diaspora. We know the personal is political, we know that creative projects write our people into history, we know that the arts are critical, always. We envision a night that embraces and holds all of that. +W.O.W. Artist Market featuring Chinatown Art Brigade, Christal Sih, Clara Lu, Emily Mock, Jia Sung, Vincent Chong and W.O.W. 's very own limited edition designs by Juliet Phillips! Purchase tickets here and follow event sneak peeks here. How do oral histories document generations past and present? How do these stories shape our future? What are the stories you have been waiting to tell? Four multimedia storytellers, scholars, and organizers share their work documenting personal, local, and global stories of the diaspora. Nyssa Chow is a writer, new media storyteller, and educator. She is a professor at S.U.N.Y. Purchase teaching writing for film, and theories of meaning creation in narrative works. As the former Teaching Fellow at Columbia University OHMA, she worked to help students bring the practice of oral history and narrative storytelling together. In her public talks she often emphasizes the importance bringing the human experience into historical scholarship, and the importance of engaging in public facing work.She is a graduate of the Columbia University’s MFA program, and the Columbia University Oral History Masters Program.She is the 2018 Recipient of the PEN/Jean Stein Grant for Literary Oral History, won for the book project, Still.Life. The project also won the Columbia University Jeffrey H. Brodsky Oral History Award. She’s a recipient of the Hollywood Foreign Press Award, the Women in Film and Television Fellowship, the Toms Fellowship, and the Academy of Motion Pictures Foundation Award. She was the recipient of a Sloan Foundation Grant, and in 2014, she won the Zaki Gordon Award for Excellence in Screenwriting. Tao Goffe born in London and raised between the UK and US, Tao Leigh Goffe is a cultural critic specializing in the narratives that emerge from histories of imperialism, migration, ang globalization. Her interdisplinary research examines the unfolding relationship between technology, the senses, memory and nature. Tao has held academic positions at New York University, Princeton University and Hunter College CUNY. She received her PhD from Yale University and Bachelor's degree from Princeton University. In 2019, she will begin a joint position as Assistant Professor in the Department of Africana Studies and the Program in Feminist, Gender, & Sexuality Studies at Cornell University. She has extensive experience as a researcher and public speaker. Her strengths are in communicating complex ideas to groups with varying levels of expertise, including both specialist and non-specialist audiences. She has undertaken internships in a variety of fields at the United Nations, Merrill Lynch, and the Museum of Chinese in America, in publishing, curating, and social media. Diane Wong is a doctoral candidate at Cornell University, where she writes on race, gender, and the gentrification of Chinatowns. As a writer, educator, and multimedia storyteller, her research stems from a place of revolutionary praxis and deep love for community. Her current research explores how gentrification led displacement politically impacts the Chinese immigrant communities in New York City, San Francisco, and Boston. Her research has been funded by the National Science Foundation, Mellon Foundation, American Political Science Association, and Smithsonian Asian Pacific American Center, and it has appeared in a variety of publications, journals, anthologies, and podcasts. Diane is currently a visiting scholar at the Asian/Pacific/American Institute at New York University where she is finishing her dissertation and working closely with The W.O.W. Project and Chinatown Art Brigade 唐人街藝術隊／ 唐人街艺术队. Join Resist Recycle Regenerate fellows in celebrating their end-of-year art projects, a culmination of skills they have learned and shared through the series of community papermaking workshops. Incorporating handmade paper recycled from Lunar New Year confetti, these projects weave together and reflect on themes of lineage, personal/collective histories, and the role of art in centering women and resisting forces of erasure and invisibility. The RRR Fellows projects respond to questions of Chinese-American identity and heritage, contextualizing our lives within local and national histories of migration. The afternoon will begin with a walk-in showcase from 5-6pm and conclude with a conversation from 6-7pm with the fellows about their experience being a part of the Resist Recycle Regenerate program as well as how they developed their projects from inception to implementation. Recognizing that gentrification is not isolated but part of a larger system of dispossession, Diane Wong and Mei Lum wanted to learn how other communities were fighting for their homes and neighborhoods. Bringing their work from east to the west coast in October 2017, Diane & Mei were able to learn from tenants, organizers, small shop owners, restaurant and garment workers, artists, allied researchers, and nonprofit workers in San Francisco, Los Angeles, Vancouver, and Seattle Chinatown. Together they share their reflections and stories of those they connected and built with during their time on the west coast. RSVP here ! As a concluding event of this series, we will be holding screenings of all three filmmakers' films at 26 Mott St. Next up is a 3-part screening collaboration with Third World Newsreel and Chinatown Art Brigade 唐人街藝術隊／ 唐人街艺术队. This raw, gutsy portrait of New York's Chinatown captures the early days of an emerging consciousness in the community. We see a Chinatown rarely depicted, a vibrant community whose young and old join forces to protest police brutality and hostile real estate developers. With bold strokes, it paints an overview of the community and its history, from the early laborers driving spikes into the transcontinental railroad to the garment workers of today. Love and labor intersect in "Resilience", a 18 minute short documentary in which I, the director, document the impact of sweatshop conditions on my family life. The film follows the lives of me, my sister Virginia, and our mother, Sau Kwan, an immigrant from Hong King who works in a garment factory. "Resilience" captures Kwan as a passionate leader in the movement against inhumane sweatshop conditions in the United States. Resilience had its US debut at the 2000 Margaret Mead Film and Video Festival in New York and its’ International debut at the 2001 Mayworks Festival in Toronto, Canada. Resilience was also screened at the Directors Guild of America for the 2002 Visual Communications Los Angeles Asian Pacific Film & Video Festival. Farewell, New Southwind is an observational documentary following a lively restaurant worker on the last day of a popular home-style Hakka Chinese restaurant in New York City, shuttering after 30 years of operation. The film is in Cantonese, with bilingual Chinese + English subtitles. What can elderly Chinese Cuban women in Havana teach us about the fight to preserve Chinatown in New York City? How does Johannesburg’s Chinatown relate to Black and Asian race relations in the U.S.? Where is home for the lineages of immigrants in the diaspora? The Chinese diaspora is worldwide. Immigrants have created home in countries where one may not expect to find thousands of Chinese restaurants in one city (Lima, Peru). In one year, Huiying Bernice Chan traveled solo to seven countries using Chinatowns as a starting point to learning about global stories of migration, activism, and resilience across the diaspora. Beginning in Latin America, stopping in South Africa, traversing Asia, and ending in Australia, Huiying shares their journey. Come join us as we wrap up the W.O.W. Project's Second Storefront Residency with our Artist-in-Residence Emily Mock! The night will feature a casual conversation and discussion of Emily Mock's work and experiences during her 6 month long residency, as well as interactive activities and a guzheng musical performance by Clara Lu.The event will include a guzheng musical performance by Clara Lu, short film documenting Emily's 6-month residency by Eric Jenkins, interactive papercutting activities led by Emily, and fun, laughs and conversation with Emily and Clara about their experience working together during the past 6 months. The W.O.W. Youth Series kicked off with an Asian American Female Filmmakers Panel this past June, centering Asian American female narratives and voices and discussing the many obstacles Asian American female filmmakers face in a predominantly white and male film industry. NYU film student and W.O.W short film director, Denise Zhou, moderated a discussion with three Asian American female filmmakers, ManSee Kong,Ursula Liang, and Theresa Loong about how their race and gender intersect to inform their work and address their challenges working in the film business. As a continuation of this series, we will be holding screenings of all three filmmakers' films at 26 Mott St. Next up is Ursula Liang's 9-Man Film. 9-MAN uncovers an isolated and unique streetball tournament played by Chinese-Americans in the heart of Chinatowns across the USA and Canada. Largely undiscovered by the mainstream, the game is a gritty, athletic, chaotic urban treasure traditionally played in parking lots and back alleys and it is fiercely protected by a community of men who who require that 2/3 of players are “100% Chinese.” A 9-Man tournament grew in the 1930’s, at a time when anti-Chinese sentiment and laws forced restaurant workers and laundrymen to socialize exclusively amongst themselves. Today it’s a lasting connection to Chinatown for a dynamic community of men who know a different, more integrated world, but still fight to maintain autonomy and tradition. URSULA LIANG is a journalist who has told stories in a wide range of media. She has worked for The New York Times Op-Docs, T: The New York Times Style Magazine, ESPN The Magazine, Asia Pacific Forum on WBAI, StirTV, the Jax Show, Hyphen magazine and currently freelances as a film and television producer (“Tough Love,” “Wo Ai Ni Mommy,” “UFC Countdown,” “UFC Primetime”) and story consultant. Liang also works for the film publicity company, the 2050 Group, is a founding member of the Filipino American Museum, and sits on the advisory board of the Dynasty Project. Liang grew up in Newton, Mass. and lives in the Bronx, New York. “9-Man” is her debut as a director. We are so excited to invite our community to participate in free papermaking workshops led by our Resist Recycle Regenerate fellows. After last week's big confetti collection, we collected an oustanding *12* garbage bags of confetti and are so excited to recycle this back into our community and create an accessible space for community members to participate in a traditional craft: papermaking. We will be holding 2 confetti papermaking workshop days (4 sessions) in W.O.W. 's studio on March 10th and 17th and will also be partnering with community organizations like Museum of Chinese in America and many more to bring our workshops to different community groups around our neighborhood. On March 10th and 17th we will be holding two 1 hour drop-in sessions a day 1:00 - 2:00pm and 2:00 - 3:00pm. Feel free to swing by and check it out and pull a piece of paper or two! *Please note that our studio capacity is limited to about ~10 people so we'll be trying our best to accommodate everyone! Our year-long Resist Recycle Regenerate workshop series aims to teach our five RRR Project fellows, Kristin Chang, Jing Chen, Melody Sang, Lily Tang, and Ja Wangpasuk the crafts of papermaking and printmaking so that they may in turn lead workshops for the community in early March. After the celebratory explosions of Lunar New Year fireworks in February 2018, together, with a group of about 10-20 community volunteers (like you! ), we will collect the discarded confetti fireworks – that are considered trash by most – to transform into paper pulp with our community. We will be stationed at 4 different locations throughout Chinatown and encourage everyone to grab a RRR Project bag, join in on the confetti collection, and drop off your ~full bag of confetti~ at any of the locations on our map! Join Wing On Wo & Co.’s second Lunar New Year 店面 Artist-in-Residence Emily Mock for the opening reception of her window display project, and celebrate the Lunar New Year early with light snacks and drinks. *SPECIAL NOTE*: W.O.W's capacity is limited so we'll be trying to circulate everyone through the space as they swing by -- we want to make sure everyone has a chance to see the window. W.O.W. Shadow Puppet Theater is a community project centered on the question “what do you do to sweep away evil?” From October through January, 店面Storefront Artist-in-Residence Emily Mock held workshops in the Wing On Wo studio and Columbus Park, teaching paper cutting and shadow puppetry. Participants made their own puppets and devised short plays based on a memory, practice, tradition, or imaginary about how they sweep away evil for themselves and their communities. These recorded plays will be featured in a month-long window installation at Wing on Wo & Co.
We have a suggested donation of $5-10 that goes towards an honorarium for panelists, a master puppeteer performance during the residency window display opening, and materials for the residency. Be sure to RSVP now through our eventbrite link in the event details! These events are FREE and all ages are welcome. Workshops will be taught in English, Mandarin, and Cantonese. Our studio space fits around 10 people, so workshops will be on a first come first serve basis. Don't let that stop you from coming! TUES 2/13 Exhibition Opening (7-9PM) Wing On Wo & Co.
THERESA LOONG is a director who creates intergenerational storytelling experiences focused on memory, identity, and immigration through the use of film, games and apps. Her documentary, “Every Day Is a Holiday,” showed on over 200 public television stations. She consulted on digital storytelling games for “The Walking Dead” and “Breaking Bad.” Theresa received distinction from the National Endowment for the Arts and the Lower Manhattan Cultural Council. Her work has been exhibited at Sala de Exposiciones, Teriennale di Milano, and Circulo de Bellas Artes. She is chairperson of The FilmShop, a film collective based in New York. *This presentation is made possible in part with public funds from the New York State Council on the Arts’ 2017 Electronic Media and Film Presentation Funds Grant program, administered by The ARTS Council of the Southern Finger Lakes. In terms of creative writing resources, Chinatown is and has always been brutally UNDERSERVED. The Chinatown Writer's Workshop is a way of 'giving back' to the Chinatown community. The W.O.W Project x Henry Chang Chinatown Writer's Workshop supports aspiring writers in the Chinese American community who have proficient writing skills and a passion to share their untold stories. The workshop sought to encourage, mentor and shepard writing projects along over a four Sunday session period from September 17th - October 8th hosted in W.O.W's studio space. Similar to many other industries, the film industry has historically been dominated by not only white, but also male voices. Asian American female narratives and voices are often silenced and it’s clear that representation matters both in front of and behind the camera. What obstacles does being an Asian American female filmmaker create in a predominantly white and male film industry? We had a discusing with three Asian American female filmmakers, ManSee Kong, Ursula Liang & Theresa Loong, discussing how their race and gender intersect to inform their work and address their challenges working in the film business. This conversation was moderated by NYU film student and W.O.W short film director, Denise Zhou. PC: Eric Jenkins & Jamie Noh. Diane Wong, sharing oral histories she recorded and collected during her dissertation research in NYC's Chinatown. - A reading with doctoral candidate, Diane Wong, who will share some oral histories she collected about the gentrification of Chinatowns across the U.S.
Mingling with the W.O.W Project community over drinks and snacks, we'll have our 1 Year Anniversary mechandise and Zine on sale! Let's Talk Chinatown: Oral Histories of a Changing Neighborhood was a workshop in collaboration with the NYPL The New York Public Library's Chinatown Legacy Project. It engaged audience members in a conversation about the changes happening in New York City's Chinatown through an interactive panel discussion with residents, business owners, designers, artists, and activists. The conversation drew from interviews that were collected as part of the W.O.W Project's Oral History Collection in collaboration with independent researcher and doctoral candidate Diane Wong. We sat down with past interviewees to share their insight on the themes of: community activism, re-generation, economic development, & the history and future of Chinatown. Panelists included: Sophia Ng Executive Vice-President at Po Wing Hong Food Market Inc. 寶榮行, Jan Lee life-long resident of Chinatown and community activist, Betty Yu co-founder of the Chinatown Art Brigade 唐人街藝術隊／ 唐人街艺术队, Lexton Moy of Cynonyc Chinatown Clothing Company, and many more. This workshop was facilitated by Diane Wong and Wing On Wo & Co.'s Mei Lum and is a part of the W.O.W Project's 1 year anniversary celebration programming for the month of May. A special thanks to Vipul G. Chopra for the beautiful flyer. We invited past participants of the 店面 Residency's Lunar New Year Red Envelope & Oral History Workshops as well as the public to come and join us for an evening of intergenerational storytelling in celebration of Chinatown stories. This event was part of a month of different programming in celebration of the W.O.W Project's one year anniversary in May. In December 2016, The W.O.W. Project launched its inaugural 店面 Artist Residency for the Lunar New Year. For the conclusion of the first storefront residency at Wing On Wo & Co., join Artist-in-Residence Melissa Liu and other artists, community organizers, and activists from the Chinatown and Asian American community for an afternoon of programming, hosted at Museum of Chinese in America. 2-4 PM: Roundtable on arts and activism in Asian American communities facilitated by Melissa Liu, 店面 Artist-in-Residence at W.O.W Project, featuring presentations from Tomie Arai (Chinatown Art Brigade,) Amy Weng (Asian 4 Black Lives), PJ Gubatina Policarpio, who will be joined by respondents Fei Moldier Liu, Emily Mock, and more TBA. The roundtable on art and activism in Asian American communities will focus on the relationship between art and social change, gentrification, and bridging cultural and intergenerational gaps, as well as activism around Asian / Asian American representation in the arts. All are welcome to participate in the roundtable to share questions, challenges, and successes around using the arts as a way to organize or advance social justice and solidarity in Asian American communities. The roundtable will start with quick presentations from featured speakers who have used art or other innovative strategies to reach specific groups in order to address social justice issues and mobilize action with those in the Asian community, and open up for discussion around other political and aesthetic concerns and goals in doing this work. 5-6PM: 店面 Residency Artist Talk with Melissa Liu. 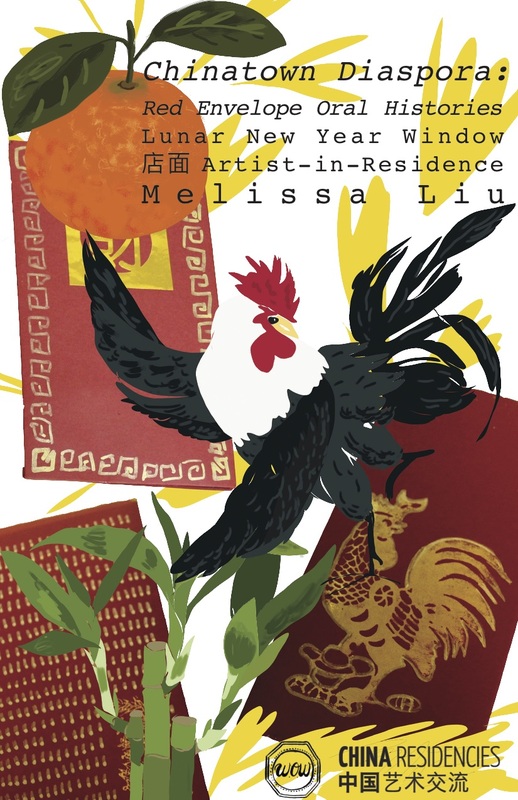 Arts writer and curator Ryan Wong will discuss with Melissa her process and motivation behind her residency project "Chinatown Diaspora: Red Envelope Oral Histories," and her work as a cultural worker and organizer in the arts. As Wing On Wo.’s inaugural Lunar New Year 店面 Artist in Residence, Melissa Liu created a window installation that is filled with handmade red envelopes (紅包, known as lai see in Cantonese, hong bao in Mandarin) and short-form oral history responses collected from members of Asian Communities in New York City and beyond. In the weeks that led up to Lunar New Year (January 28, 2017), anyone identified with the Asian Diaspora celebrating the Lunar New Year was invited to participate in workshops organized by Melissa in collaboration with The W.O.W. Project, local artists, and community members and groups. Participants had the opportunity to design and make their own red envelopes, in which they placed a question to share with a family member or friend from an older generation and collect a written response from. Participants also received basic training on how to conduct an oral history interview within their community, and had a safe space to discuss issues that Asian communities face in today’s political moment. Wing On Wo & Co.’s inaugural Lunar New Year 店面 Artist-in-Residence Melissa Liu held an opening launch of her window display project, and celebrated the Lunar New Year early with light snacks and drinks at the window display opening. Read more about the inaugural 店面 Residency here. As with other Chinese diasporic communities across the globe, Manhattan's Chinatown has historically been dominated by men and male-run institutions. On Saturday December 10th, join us as four women, early pioneers in Chinatown's business community, labor organizing and the arts and those continuing the struggle, come together in The W.O.W Project’s first public panel since the presidential election. Conceived as part history lesson and community strategy session, we envision this evening as a safe space and a space for reflection, regrouping and mobilization by those confounded by recent political developments. This panel is part of a larger series of conversations about Chinatown in the hopes of nurturing and sustaining community. Panelists will share their experiences working at various historical junctures and the lessons and strategies gleaned from those contentious times that may be helpful to us today. The panel includes Ching Yeh Chen co-founder and owner of Pearl River Mart, May Ying Chen union organizer who has devoted a career of more than 25 years to the garment workers’ union: Local 23-25 Workers United/SEIU, Cynthia Lee former VP of Exhibitions, Programs & Collections at the Museum of Chinese in America, who led the development of MOCA’s new core exhibition, “With a Single Step: Stories in the Making of America,” and Sophia Ng Executive Vice-President at Po Wing Hong Food Market. The discussion will be moderated by cultural worker Lena Sze. The W.O.W Project and China Residencies are teaming up to launch The 店面 Residency, a two-month residency in NYC's Chinatown to create storefront displays for Chinese New Year. Photo credit: Evan Louis // Our five finalists posing with their designs. 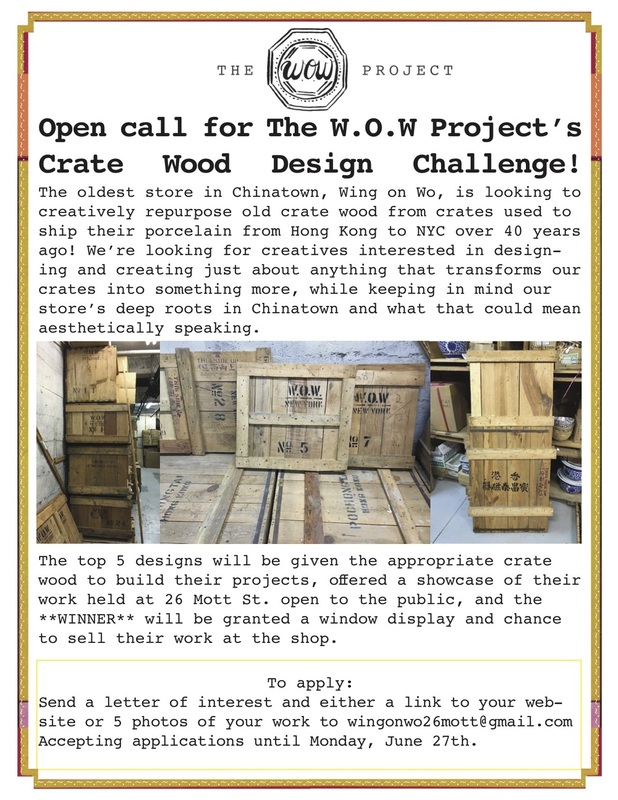 The W.O.W Project featured our five finalists and their designs created with our crate wood raw material and inspired by the W.O.W Project's community vision. The public was invited to view and interact with our finalists' work. The winner was chosen by showcase goers and determined by popular vote. Angela Choi + her Chinatown-themed story board and interactive game, Juliet Phillips + her W.O.W Guestbook, Dan Ping He & Jeffrey Louie + their community bench and planter, Karen Beck + her W.O.W skateboard, and Morgan Cady-Lee & Ming Huang + their rickshaw mobile desk. 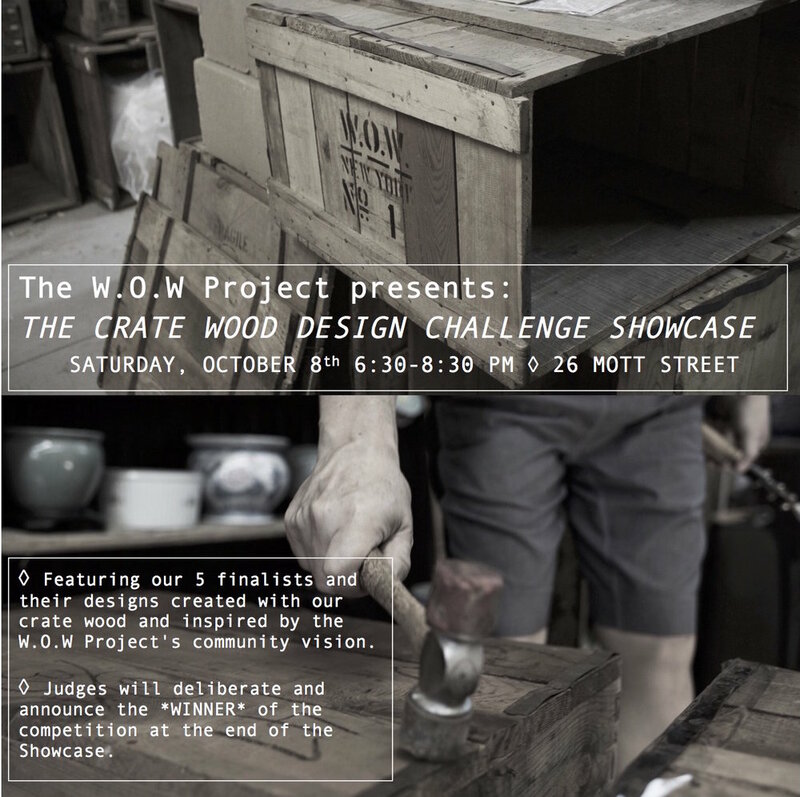 Our finalists' pieces are on view at 26 Mott St. Come visit and see these amazing crate wood designs pieces! The W.O.W Project in collaboration with Diane Wong, doctoral candidate at Cornell University, hosted the Asia Society's U.S - China Dialogue Young Scholars for a round table discussion about the global effects of gentrification in Chinese communities. Mei and Diane facilitated the scholars through an exercise in deconstructing words and phrases associated with the term "gentrification." 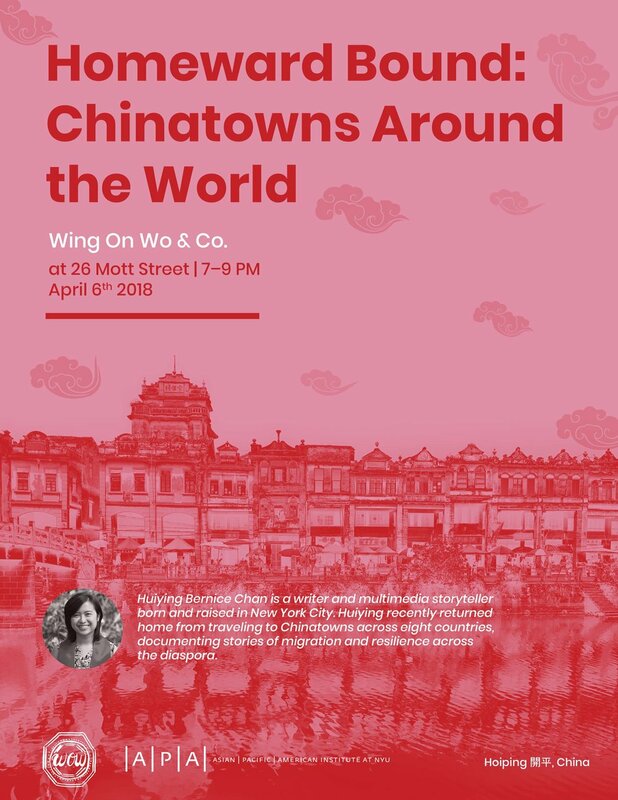 Using New York City's rapidly changing Chinatown as a context for discussion, scholars were encouraged to share how they have seen their communities across China effected by increasing development. Photo credit: Donna Karimi // Young scholars discuss how their communities in China have been effected by gentrification and development. 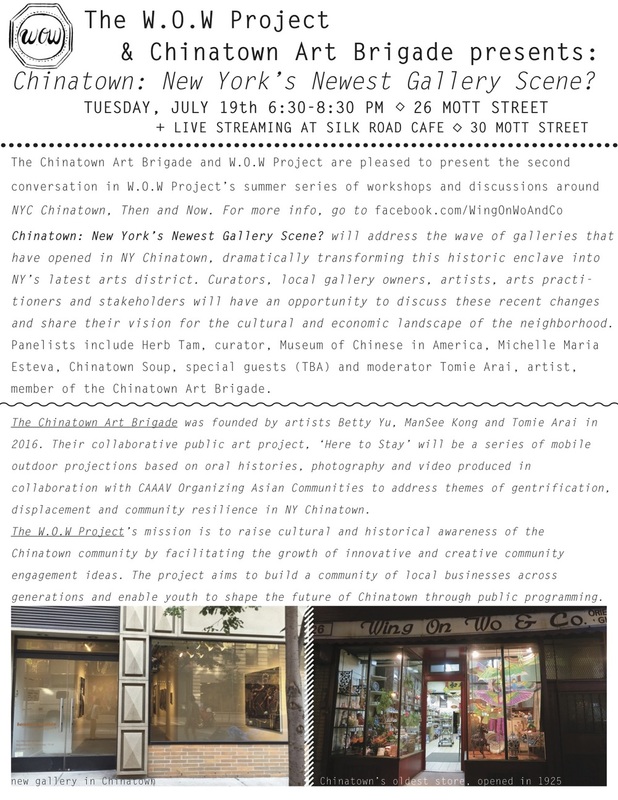 The W.O.W Project & Chinatown Art Brigade were happy to announce the second conversation in The W.O.W Project's summer series: Chinatown: New York’s Newest Gallery Scene? addressed the wave of galleries that have opened in NY Chinatown, dramatically transforming this historic enclave into NY’s latest arts district. Curators, local gallery owners, artists, arts practitioners and stakeholders had an opportunity to discuss these recent changes and share their vision for the cultural and economic landscape of the neighborhood. Panelists included: Herb Tam, curator, Museum of Chinese in America, Michelle Maria Esteva, Chinatown Soup, and moderator Tomie Arai, artist member of the Chinatown Art Brigade. As the first event of the W.O.W Project Summer Series, this panel engaged second and third generation Chinese Americans who have chosen to either revive their family businesses or start their own businesses in Chinatown. We had a conversation about the role they play in shaping Chinatown's future, especially in the midst of rapid neighborhood changes. The discussion was moderated by Diane Wong, a doctoral candidate at Cornell University who writes on the intersections of race, gender, and the gentrification of Chinatowns across the country. Full video footage here. Panelists included: Amy Li of Amy Li Projects, Chris Wong of Breakroom, Michael Tan of Eggloo, Tommy Leong & Cory Wong of Mott Street Cycles, Richard Tam of 10Below & Mei Lum of Wing on Wo & Co.